Procedures for turning a twitter feed into an RSS feed that could be read with an RSS reader (e.g., feedly) are remarkably cryptic, so I made this post to lay out the easiest method that I've found. Commenters: please let me know a better way. In this example, let's suppose that we want to follow Bernie Sanders, whose twitter id is @SenSanders. Begin with a www browser, but not Safari! Make sure that the address bar is visible and point it to Queryfeed.net. 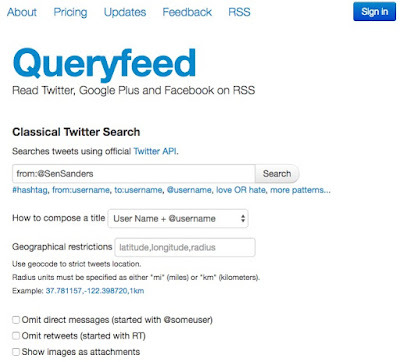 At Queryfeed.net, go to the first field, which is labeled "Search term", and ignore all others. Put in from:@SenSanders, as shown below. Click the search button. Ignore the www page that shows, but copy its URL. The URL that you copied is the one to add to your RSS reader. Each new tweet from @SenSanders will appear as a news item in your reader. The problem with Safari is that it assumes that you don't actually want to see the XML from an RSS feed, or, more important in this case, its URL, but merely want to add it to Safari's RSS capability. 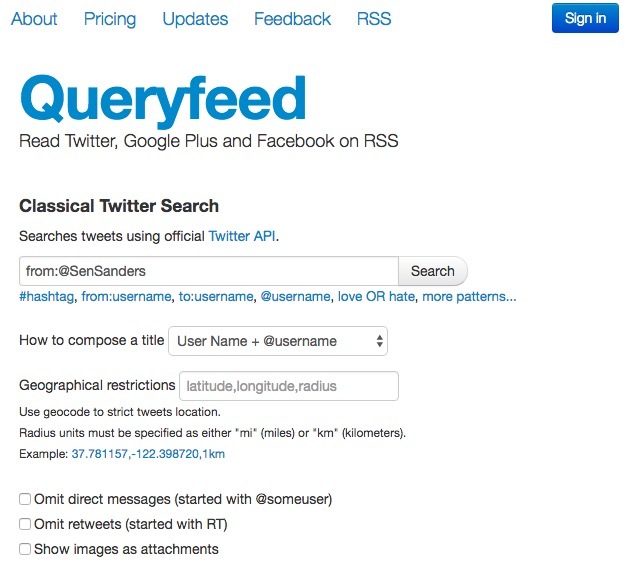 Queryfeed's from option restricts the feed to posts from @SenSanders. Drop the "from:" if you want all mentions of @SenSanders. In this example, the URL copied is https://queryfeed.net/twitter?q=from%3A%40SenSanders&title-type=user-name-both&geocode=. The part of the URL after SenSanders is optional. To add the URL to feedly, sign in to feedly and click "Discover and Follow". Enter the URL in the search field. Choose the Queryfeed result and then "+feedly".